I have been meaning to write for the past couple of weeks as I have been guided by Spirit that I need to share my experiences. Time has gotten away and here it is at the end of January. It has gone so fast. I have been doing this work for about 30 years and still it continues every day. I have been in the corporate world and left many jobs due to the ascended beings I work with urging me to be more within myself. I have been almost penniless at times, lived in dark places with others, fought the lower energies in many different types of environments, but yet continued my inner journey to step into mastery no matter what the diversions might have been. My present challenges are more about my role with others ~ helping them to learn more about themselves. In the process I learn more about myself and my ascension process. I moved to Mt. Shasta in the summer of 2011 not knowing what my life would be like. When I think about on my journey from the east to the west of the United States, I don’t know how I achieved it. I was on a mission to arrive in Mt. Shasta and nothing was going to stop me although many energies truly tried to do so. I lost my bank card and had to have money wired to me through a friend. I went to places where I felt energetically it was unsafe but I stayed within my power of my higher essence with the greatest protection of all. I was dealing with an infection in my right leg in the vein which I created due to stress but it did not stop me. I continued onward like the pioneer I have been taught to be. I utilized the Golden Flame to assist areas as I drove. I had to drink coffee to stay grounded and oh, I had to deal with a beautiful cat that truly was not happy with the journey. I have reflected many times and felt the fear I did not exhibit at that time. I learned to put it into wholeness as that reality is now gone. I arrived safe and sound although problems resulted with my tires afterwards. I realized how protected I am and have worked hard to continually stay within that higher level of consciousness. It has given me the most beautiful gifts that I could ever experience in my life. My energy was so high at that time that it was hard for me to stay in my body. 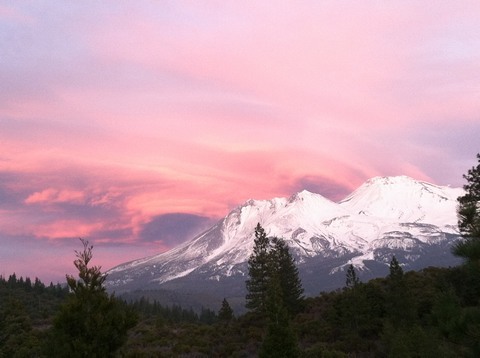 As I arrived in Shasta, that all changed for me. I arrived “home”. Lord Adama assisted me to create more and I would be more than “okay”. That was then and now I reflect upon those moments. In our teachings Lord Adama is always talking about how important it is to reflect on your past moments to see the achievements you have created within your pathway. If you had told me 20 years ago that I would be able to take this journey alone and not knowing what I would find, I would not have believed you as the strength and courage was not within me at that time. The pathway of Mastery has shown me how to create and evolve into the ascended master I have become. I still have a hard time utilizing those words but I am being guided that it is very important to accept my challenges that have molded my present circumstances. I had accelerated within my initiations that I thought I could go no further. I needed assistance. I truly needed grounding and had been asking for this to occur in the form of a partner. By the time I left for Mt. Shasta I was not expecting anything to happen for me. I was stepping off a cliff and into the unknown. I was to receive a gift beyond all gifts in Mt. Shasta. My friend, Mike, arrived to experience Mt. Shasta. We had had a brief friendship in New Jersey. Lord Adama kept telling me to ask him to come but yet I was unsure why I should do so. Our time together was flowing and very empowering for me. Lady Isis helped me tremendously to show my feminine divine without any constrictions or worries of “what was to be”. Mike decided he wanted to partner with me in my work and would return as business associates. What we found together was not planned and could only have happened in Mt. Shasta. We worked hard with the Lady Masters to clear and balance our past relationships. They sent us to the portals of Mt. 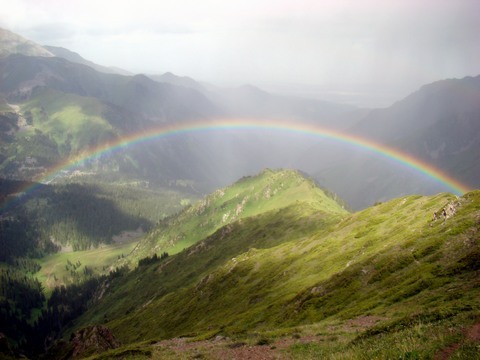 Shasta to receive the healing and acceleration that was needed to stand together as partners. Mike’s heart opened up deeply in a way that Meleriessee could never imagine. I had a challenging time it was actually happening, but it did and still continues to this day. On 11:11:11 Meleriessee and Mike performed ceremonies around the Mt. Shasta area and Mike became the Initiator of preparing the ceremonies while Mel brought in the energies. It was their beginning together of walking side-by-side to help heal the Old Earth into the New Earth. This was not easy for me as I had to surrender the work I had created and share it with Mike. But yet, in my heart, it was time to hand the power over to the male energy that had arrived within my world. Our partnership immediately grew into a deep love for one another that each of us was blocking within our present consciousness. We walked into a Twin Flame Union from a Twin Soul Relationship. The pathway we both stepped upon was prepared by each of our higher self’s to occur. I as, Meleriessee, had a deep knowledge of the ascension pathway and mastery through Dr. Stone’s work and had been ordained in 2003 through Dr. Stone. I was very dedicated to teaching others the way of mastery upon this earth. Mike had a strong background which was similar but no knowledge of the Brotherhood of White Light and the many masters that work within the mastery levels. He was open to receiving the accelerations and accepted that this was now his world. There have been many challenges for both of us through this process. When we walked into Mt. Shasta, we stepped into learning how to live 5th dimensionally. This meant that our interactions with one another would change along with others we would work with. In order to teach the way of the Telosians of the Inner Earth we needed to experience it first-hand. This took a lot of responsibility on our parts and great sacrifice especially for Mike who had two children back East that would have a hard time understanding the life that he had chosen. We also came to the realization that our life within Lemuria included these energies but we lost the battle at that time. So we have arrived here in Mt. Shasta to cleanse and purify as much as we can standing for the pioneers for the New Earth with Lord Adama as our guide. This past Christmas Mike surprised me by wanting to order rings for both of us for a special ceremony. We always knew that we were existing in the 5th dimension and a 3rd dimensional wedding did not fit our lifestyle or consciousness any longer. We always laughed that it would happen when we were fully able to be in Telos with our soul brothers and sisters. So we picked out the amethyst rings in sterling silver. We decided we would have a ceremony during the holidays. Two special friends, Noriko and Rochelle were with us for our retreat and the holidays. On January 1st, we drove up to the mountain to our sacred spot not far from Ascension Rock where we had done the 11:11 ceremony. Mike took care of everything. He provided the ceremony. It was all done in the moment. We were not sure which day we would do the ceremony but the 1st felt appropriate along with the New Moon energies of the New Year. A dear friend and client had sent us some lovely garments from India so Mike wore this special ceremonial outfit which looked very Telosian. I had on a white skirt with many layers of clothing as we wanted not to wear coats. We were gifted with the weather being cold but not so cold that we could go without our jackets. I had a beautiful shawl that our friend sent me from India so I used that as a covering around my shoulders and head. 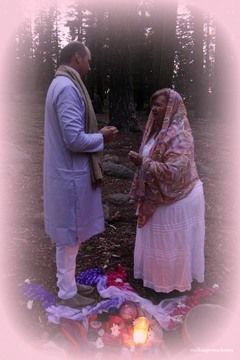 This special ring ceremony represents our Divine Union of coming into Twin Flames into a Twin Ray. This is very unusual at this time but will be commonplace for the New Earth. We work within the Pink-Violet Ray of Vibrational Communication which really describes our work on the planet. We stood amongst a beautiful altar with our scarves of Violet and Pink around our feet. We shared our hearts with one another in the union of each other. I thought that this was magical and it truly set up my year for 2014. This was just the beginning of my journey with my beloved, Michael Aranathanara. On January 15th Mike announced to me that Lord Melchizedek shared that it was time for me to ordinate Mike in the Melchizedek Priesthood within the planetary level. I had the ability to do so since I was ordinated under Melchizedek Synthesis Academy/Universal Life Church. It was our first ordination for Walking Terra Christa. We stood in our healing room in front of our Violet Ray Wall Banner as Lord Melchizedek stood with us in his higher dimensional body. I gave a beautiful ordination that Mike Aranathana was now inducted within the Priesthood for the New Earth. We now walk with one another hand-in-hand celebrating our union and our spiritual partnership for the New Earth. It is an honor and pleasure to have Mike by my side in all of my endeavors within my life. I am deeply grateful for the most powerful times in my life that have helped me mold this new beginning in my life. Without all of the intense challenges I have endured, I would never have been able to survive upon this Earth in such a beautiful and magical journey.